No matter where you live, you live in a watershed. 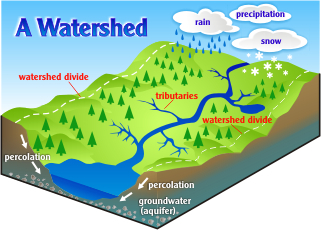 A watershed is the land area that drains to a single body of water such as a stream, lake, wetland,or estuary. Hills or ridgelines often bound watersheds; interior valleys collect precipitation in streams, rivers, and wetlands. These physical boundaries define the movement of water and delineate the watershed. Watersheds, also known as catchments or basins, describe geography at many different scales: a few acres may drain to a small stream or wetland; a few large rivers may drain into an estuary where fresh and salt water mix; about 40 percent of the U.S. land area in the lower 48 states drains to the Mississippi River. Watersheds are thus nested...larger watersheds such as the Mississippi River basin encompass many smaller watersheds. What is the Watershed Approach and Why are We Using It? A "watershed approach" uses hydrologically defined areas (watersheds) to coordinate the management of water resources. The approach is advantageous because it considers all activities within a landscape that affect watershed health. Ideally, a watershed approach will integrate biology, chemistry, economics, and social considerations into decision-making. It considers local stakeholder input and national and state goals and regulations. A watershed approach recognizes needs for water supply, water quality, flood control, navigation, hydropower generation, fisheries, biodiversity, habitat preservation, and recreation; and it recognizes that these needs often compete. It establishes local priorities in the context of national goals and coordinates public and private actions. A watershed approach offers a blueprint for water resource management. A comprehensive watershed approach improves on the fragmented approach the nation has used in the past. The United States has developed separate laws for clean water, clean air, fertile soils, productive fisheries, healthy forests and robust communities. It created separate agencies to administer those laws at federal, state, and local levels and on public and private lands. These agencies have different missions, authorities, and modes of operation. The property boundaries of landowners and the political boundaries of states, tribes, counties, and municipalities are often unrelated to watershed boundaries. As a result, when citizens or governments have tried to coordinate water resource protection or restoration efforts, they have often found it difficult to do so. Evidence suggests that the watershed approach improves collaboration and information sharing among diverse partners and leveraging of resources. This document frequently uses the terms protection and restoration. Watershed protection measures reduce impacts to waterbodies and prevent degradation. Protection measures include both voluntary and legally mandated actions. Paying farmers to set aside conservation easements, for example, ensures that some lands have limited human impacts, while water quality permits limit pollutant releases into waterbodies. Watershed protection measures that prevent degradation before it occurs typically cost less and succeed more often than watershed restoration measures implemented after watersheds are impaired. Protected watersheds are more likely to be healthier watersheds. Watershed restoration is more difficult to define. The Wetlands Subcommittee of the Federal Geographic Data Committee defined wetland restoration to provide a standard for federal agency reports of their restoration activities. This group defined restoration as .the manipulation of... physical, chemical, or biological characteristics... with the goal of returning natural/historic functions.. Similarly, in the 1992 report "Restoration of Aquatic Ecosystems" the National Research Council defined restoration as the "return of an ecosystem to a close approximation of its condition prior to disturbance." That report also states, "The term restoration means the re-establishment of pre-disturbance aquatic functions and related physical, chemical, and biological characteristics" In summary, restoration activities seek to restore healthy aquatic communities and provide clean waters for recreation, irrigation, and public consumption. For a more detailed discussion of watershed restoration principles, visit the Environmental Protection Agency's "River Corridor and Wetland Restoration" webpage. Watershed restoration can be challenging. Most restoration efforts do not show immediate results. Some restoration activities can even unintentionally harm the environment. All restoration efforts require a long-term commitment. A watershed approach highlights relationships among land management decisions, everyday actions, and watershed health. The next section of this report discusses threats to watershed health such as pathogens, chemical pollutants, and invasive species. Most are caused by commonplace activities: clearing forested lands for new housing developments; paving new roads and driveways for transportation; over-applying fertilizers and pesticides to lawns; overworking farmlands and timberlands; or postponing maintenance to home septic tanks. Only by understanding these problems and reducing our impacts can we assure healthy watersheds for our use and enjoyment. In 1890, John Wesley Powell, second director of the U.S.Geological Survey suggested that the federal government organize the western United States into watershed units These watershed units would be governing bodies and would facilitate an integrated approach to natural resource management Although the government did not implement his plan Powell’s perspective underscores the importance of our relationship with the land and the need to consider it as we protect and restore aquatic resources.